April 17, 1950 – Speaking in the Crystal Room of the Blackstone Hotel, Walter Gropius, head of the Department of Architecture at Harvard University, speaks of a new era in which art and industry work together. 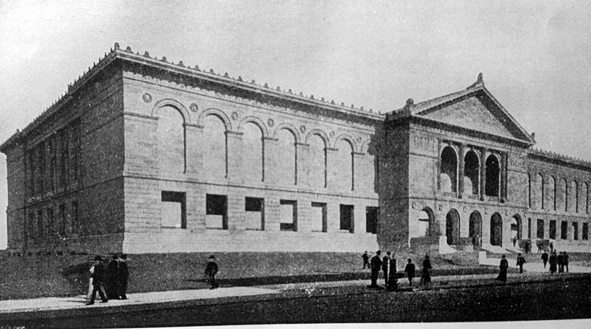 The gathering is a celebration of the formal announcement of the addition of the Institute of Design as a degree-granting program at the Illinois Institute of Technology, a department at the school that grew out of the New Bauhaus that Gropius and László Maholy-Nagy established in the city in 1937. 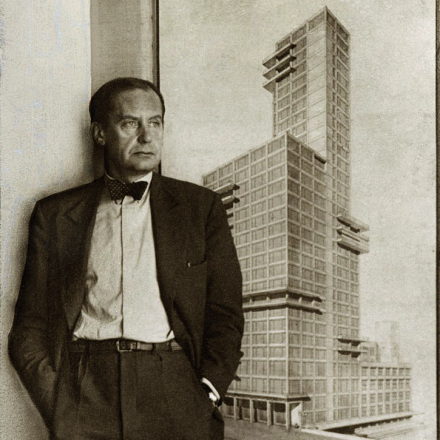 Gropius says, “The artist is coming into the fold of the community. From his ivory tower he will move closer to the test laboratory and to the factory; he will become a legitimate brother of the scientist, the engineer, and the business man.” [Chicago Daily Tribune, April 17, 1950] The architect also praises the program at I.I.T. for its commitment to creating such collaboration. May 15 -- Education. Industry. Literature and Art. Moral and Social Reform, Philanthropy and Charity. Civil Law and Government. Religion. May 22 -- Public Press. Religious Press. Trade Journals. May 29 -- Homeopathic Medicine and Surgery. Eclectic Medicine and Surgery. Medico-Climatology. June 5 -- Organizations represented by the National Temperance Society of America, Sons of Temperance, Catholic Temperance Societies, Women's Christian Temperance Union, Non-Partisan Women's Christian Temperance Union, Independent Order of Good Templars, American Medical Temperance Association. Vegetarian Societies. Social Purity Organizations. June 12 -- The International Conference and National Conferences of Charities, Correction and Philanthropy. Instructors of the Feeble Minded. Humane Societies. The King's Daughters. Society of St. Vincent de Paul and kindred organizations. The Salvation Army. A Conference on Charities, Correction, and Philanthropy will begin in one of the smaller halls of the Art Institute June 8. This will be preliminary to the General Congress. June 19 -- Bankers and Financiers. Boards of Trade, Railway Commerce, Building Associations, Merchants, and Insurance Congresses, including: Fire, Marine, Life and Accident, Mutual Benefit and Assessment, Fidelity and Casualty, Conference on Insurance Specialties. July 3 -- Musical Art. Musical Education. July 10 -- Authors. Historians and Historical Students. Librarians. Philologists and Folk-Lore. July 17 -- College and University Faculties, including University Extension, College and University Students, College Fraternities, Public School Authorities, Representative Youth of Public Schools, Kindergarten Education, Manual and Art Training, Physical Culture, Business and Commercial Colleges, Stenographers, Educators of the Deaf, Educators of the Blind, Chautauqua Educations, Social Settlements, and a General Educational Congress, in which all branches of education will be represented. July 31 -- Civil Engineering, Mechanical Engineering, Mining and Metallurgical Engineering, Engineering Education, Military Engineering. Marine Engineering and Naval Architecture. Aerial Navigation. July 31 -- Architecture. Painting and Sculpture. Decorative Art. Photographic Art. Conference on Art Museums and Schools. August 7 -- Jurisprudence and Law Reform. Civil Service Reform. Suffrage, in Republic, Kingdom and Empire. Government of Cities. Patents and Trade Marks, social and Economic. Science -- Weights, Measures, Coinage and Postage. Arbitration and Peace. August 14 -- Dental. Pharmaceutical. Medical Jurisprudence. Horticulture. Congress on Africa, the Continent, and the People. August 21 -- Astronomy. Anthropology. Chemistry. Electricity. Geology. Indian Ethnology. Meteorology. Philosophy. Psychical Research. Zoology. August 28 -- The Condition of Labor. Work and Wages of Women and Children. Statistics of Labor. Literature and Philosophy of the Labor Movement. Labor Legislation. Living Questions and Means of Progress. Arbitration and Other Remedies. August 28 -- Economic Science. Science of Statistics. Taxation and Revenues. Separate Conference on what is called "The Single Tax." Profit-Sharing. Weights, Measures, Coinage, Postage. September 5 -- A series of union meetings in which representatives of various religious organizations will meet for the consideration of subjects of common interest and sympathy. Denominational presentations to the religious world as represented in the parliament of religions of the faith and distinguishing characteristics of each denomination, and the special service it has rendered to mankind. Informal conferences in which the leaders of a particular denomination will be present to answer inquiries for further information. Denominational Congresses in which the work of the denominations will be more fully set forth and the proper business of the body be transacted. The Art Building will be so occupied that these Denominational Congresses cannot be held in it. They will for that reason be held in Chicago churches, which will be placed at the disposal of the denominations for that purpose. Congresses of Missionary Societies. Congresses of Religious Societies. September 28 -- On Physiological Grounds. On Economical Grounds. On Governmental Grounds. On Social and Moral Grounds. On Religious Grounds. October 13 -- Sanitary Legislation. Jurisdiction and Work of Public Health Authorities. Prevention, Control and Mitigation of Epidemics and Contagious Diseases. Food Inspection and Other Food Problems. October 16 -- General Farm Culture. Animal Industry. Fisheries. Forestry. Veterinary Surgery. Good Roads. Household Economics. Agricultural Organizations and Legislation. Agricultural Education and Experiment, including Agricultural Chemistry, Practical Geology, Economic Climatology, Economic Entomology and Practical Botany, and other scientific subjects.